Can One Laptop per Child Transform Rwanda's Economy? Sitting behind a rickety desk in a room with cement floors and water-stained walls, Faina Iradukunda, 13, tinkers with a rudimentary animation program on a shiny green-and-white laptop. A cartoon cat dances across the screen and Faina smiles with pride. Her proficiency with the program, called Scratch, is startling given that she had never used a computer before a few months ago. "I had heard from others who had the laptops that they were doing things, but when I got the laptop I was very excited and felt my dreams were coming true," Faina said through a translator. "I've found it easy. Learning how to use it is not too difficult." The cute little laptop with its iridescent green keyboard is an XO, designed by the One Laptop per Child (OLPC) program. Rwanda has just finished a pilot OLPC program and plans to buy and distribute another 100,000 computers  at $181 each  to children by next June. A year after that, it wants to distribute laptops to half of Rwanda's 2.5 million schoolchildren. OLPC wants to transform education in poor countries by giving children laptops that will, as it says in its mission statement, spark "collaborative, joyful, self-empowered learning." The results of the deployment in Rwanda will, in some ways, determine OLPC's future; while the program has distributed more than 1.4 million laptops in 35 countries around the world, no nation as poor as Rwanda has embraced OLPC founder Nicholas Negroponte's idea so fully. Deployment there will be a proving ground for OLPC's premise, that distributing laptops to the world's poorest children will make their lives better. "What is different about Rwanda is [President] Paul Kagame's long-standing belief in us and us in him. We will walk to the end of the earth to help him and Rwanda," Negroponte told TIME in an e-mail interview. "We want Rwanda to be a showcase." To understand Kagame's decision to invest in laptops for Rwanda, you have to understand his vision for his country's future. Kagame wants to triple the size of Rwanda's economy by 2020, no easy task in a tiny, landlocked nation that has no natural resources and whose history includes the 1994 genocide, which killed 800,000 people. The President wants to make Rwanda a technology and services hub  another tall order considering that just 7% of the country's 11 million people currently have electricity. And that, curiously enough, is where the laptops come in. He and OLPC proponents hope the computers will both teach the students the language of technology and offer them a way to chase down simple information they lack but which kids in rich nations take for granted. According to the government's vision, the laptop will be the engine for the spread of electricity and Internet across the country. The government is paying to deliver power and the Internet to the schools where laptops are deployed. The surrounding communities will then be able to tap into those services. "Rwanda has been taking a lot of bold steps to ensure that it speeds up its development because we've lost so much time," the Rwandan Education Ministry's OLPC coordinator, Nkubito Bakuramutsa, referring to the genocide. "Rwanda wants to place itself as a player, first in East Africa, then in Africa and then worldwide, and for that to happen, we want to make sure all the kids have minimal access to the same knowledge that you would have in New York or California or Japan." Given that there is no hard data on the effectiveness of OLPC, it is a risky  and costly  experiment for Rwanda, a country with an annual budget of just $1.2 billion; the per-laptop price of $181 is also more than half the average Rwandan's annual income. Skeptics of the OLPC program ask why Rwanda and other poor countries should spend so much money on the program's specially designed XO laptops when teachers often earn less than $100 a month. 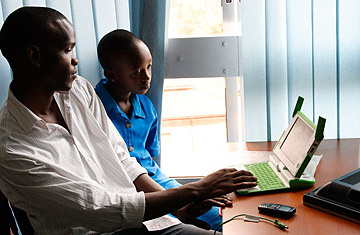 Indeed, Rwanda's poverty has thrown up some unexpected challenges to the OLPC vision. One of the program's key principles is to involve children more in their own education by giving each of them their own laptop to take home each night. But for now, the two schools in Kigali that use the laptops keep them locked up after the school day. One problem has been that parents say that they do not want to be held responsible if the laptops are lost or stolen. Several students have sold their laptops to unscrupulous buyers for less than $10  to the kids and their parents, still an enormous sum. Like children everywhere when they get their hands on an exciting new piece of technology, kids can also use the laptops to distraction. In poor places such as Rwanda, where children are so integral to a household economy from a young age, fetching water and helping with farming, for example, those distractions can be disastrous. "These are still young children and they are excited, they love laptops very much, beyond anything else, so the parents find it is becoming an obsession," said Francoise Murekeyisoni, the principal at Nonko primary. OLPC workers say that by introducing laptops, they will allow kids to circumvent the shortfalls of their anachronistic national curriculum and poorly trained teachers. Rwanda faces other hurdles: a government decision to switch teaching from French to English, even though many teachers still don't speak English fluently; and the country has yet to recover from the fact that many of Rwanda's teachers were killed during the genocide. "We need to take these steps, start immediately and, as we go along, figure out a way to make it work," says the Education Ministry's Bakuramutsa. "We usually throw ourselves in the water and, while swimming, figure out how we're going to do the last steps."